Shopping before school from 8:00 am – 8:30 am, during lunches, and scheduled conference times. This is a great opportunity to pick up some new books before the holidays to keep or give as gifts. drawing for each grade level on Wednesday and Thursday of the fair. chosen after lunch on Friday. books from the fair and Scholastic will donate a book for every $1 raised to one of its charities. clean out the cushions or under the car seats and donate that loose change. 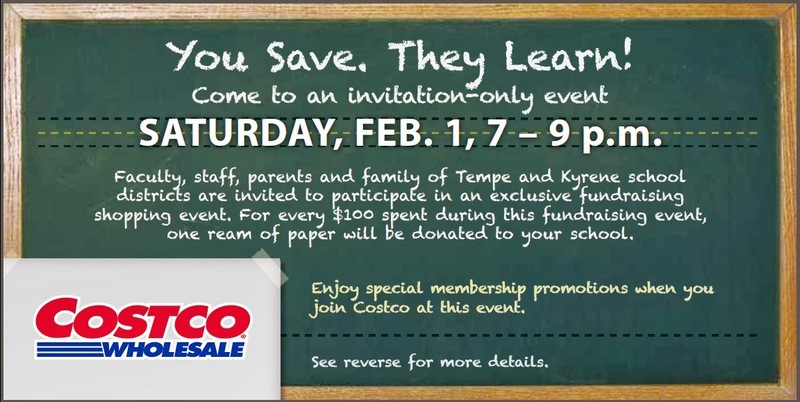 Kyrene Night at Costco in Tempe! Entertainment Book Fundraiser extended to Friday, September 12th. We are close to our goal of selling 500 books. Please help us reach it! Turn orders in before school on Friday! Lots of fast food coupons! The PTO Entertainment fundraiser will run from August 19th to September 3rd. The money that is raised will be used for student and teacher support; character and diversity education; school supplies; eighth grade promotion activities; student grants and more. We greatly appreciate your support of this fundraiser and any cash donation that you would like to make! Please make your checks out to KMS PTO. If I purchase online will KMS earn proceeds? Yes. Be sure to create an account at http://sellersection.entertainment.com using group ID # 66374 and your personalized link will be connected to KMS. How much are shipping costs for books purchased online? Shipping is free. This means that your friends and family around the country can buy the version specific for their area for only $30. We will only be providing Phoenix area editions at school. Purchase other area editions online and have them shipped directly to your customer. What deals are available this year? Browse the deals at https://www.entertainment.com/coupon/ Remember that with the purchase of the book you also get the mobile app and email deals! Sell 1 book receive a hippo collectible keychain. Sell 2 books receive dino plush with secret pouch. Sell 3 books receive a “Find Me” item locator. Sell 5 books receive a SkinIt custom phone cover or beard hat. Sell 7 books receive Bluetooth mushroom speaker. Sell 10 books and receive a Chitter Chatter. Sell 15 books and get a life size celebrity standup or $20 Target gift card. You earn the prizes for each level you achieve. Bonus prize: Sell 20 or more books and you get one bonus gift card. The dollar amount increases at 30, 40 & 50 books sold! Each book sold will earn an entry into a raffle for additional prizes including: $50 cash, KMS t-shirts, gift cards and more. That means that if you sell 10 books, you get ten chances to win. When will I receive my prizes? The prizes will be handed out on the order fulfillment days: Wednesday, August 27th; Tuesday, September 2nd and Wednesday September 3rd before school. You’ll turn in your money and orders, and receive your books and prizes all at the same time. Please make checks out to KMS PTO. If you have orders to turn in on the first day, August 27th, you'll get an iFriday pass as a bonus prize. We greatly appreciate your cash donations. Cash donations will earn raffle tickets and a prize. Welcome to the start of another great school year at KMS! The KMS PTO is again looking forward to providing activities that enhance academic and character education for KMS students through volunteer and monetary support. Volunteering and becoming involved in your child's school won't just benefit your child, his classmates, and the community; it will also benefit you! Research shows that those who volunteer are healthier and happier. So do yourself a favor and GET INVOLVED THIS YEAR! A great first step in doing so is to stop by our PTO OPEN HOUSE, Wednesday, August 13th @ 6:30 p.m. in the library. Come mingle and visit with other parents who want to get involved. Learn about activities sponsored by PTO and see what KMS PTO is all about. Refreshments will be served. It will be a fun night to make new friends. WE NEED YOU and so do our KMS kids and teachers! Hope to see you there! The winner of the Diamond Backs suite is George Villalobos. We raised 1400 dollars, all of which will directly impact the students at KMS. Thank you SO much for your support KMS community, we appreciate it! The Drawing will be held on Monday, May 12th, so don't lose hope yet. Thank you for EVERYONE who donated to an amazing cause at KMS! You have the opportunity to win an 18 person suite for the Diamondbacks game of your choice (excludes post season). Must be 18 years or older to buy tickets. Drawing will occur on May 9, 2014. Proceeds benefit the PTO and Teacher Enrichment Education Scholarship Fund. Spring is finally here. To celebrate, we'll donate $5 per new member supporting Kyrene Middle School in the month of April. No purchase necessary. In other words, for free. If a new member supports a different group, we'll donate $5 to that group. Here's the challenge. iGive must get at least 1,000 new members a day (supporting any cause, it doesn't need to be yours) in April. They need to try the free and optional iGive Button through 7/15/14. In our best months, we'll get 1,000 to 1,500 people joining each day. What we're hoping is that you'll tell all of your friends, even those friends who might support causes or charities different from your favorite. That'll make April a Best Month. When they shop, they'll help Kyrene Middle School or their own favorite cause. Why not let them take advantage of over 1,400 stores that want to help? The average shopper is raising over $30 - $100 a year for their cause ... all for free. Five bucks free, just for trying us out. The more iGive members, the better the deals we can get from stores. Spread your iGive link everywhere (Facebook's a great way, but Twitter, e-mail, blogs, bulletin boards, and handouts all work). There are some exciting events coming up with the KMS pto. 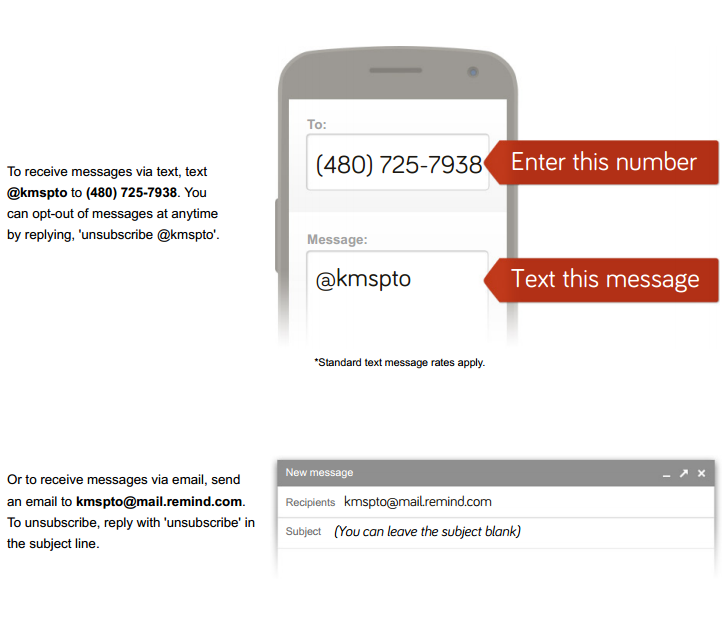 There is the KMS/Waggoner 5k/1mile walk/run -- you can sign up here and also get more info! Also, we are doing a FUNdraiser at the Tempe Improve, Comedy Hypnotist Flip Orley will be there, and tickets are only 15! Buy tickets below! March 17th-21st – BOGO Book Fair – Books are good for the brain! Buy one get one free during the spring KMS book fair. March 21, (Friday) – Lunch with you Student! Get out and get fit! March 30, (Sunday) 7:00pm – Parents Night Out at the Tempe IMPROV! Tickets are $15/person! Featuring the amazing Flip Orley Show. Ticket sales will start soon, stay tuned for more info!!! PTO NEEDS YOU! Looking for a way to get involved, be in touch with the school, get to know the administration? Become a PTO officer! If interested contact Lisa Firestone at Lfireoz@gmail.com and/or come to the Feb 5th or March 5th PTO Meetings, 8:45 a.m. in the Front Office. Taste of Kyrene Opportunity Drawing tickets. This year the Opportunity Drawing is more exciting than ever giving 50% of each ticket sales back to the KMS. Each ticket costs $10. Grand prize for the drawing: Get Away Today will generously offer the grand prize of a choice between a Disneyland or Sea world vacation for 2 adults and 2 children (ages 3-9) for 4 days and 3 nights! The drawing will be held at the Taste of Kyrene main event on February 28th, 2014. Because the prize is donated, all proceeds from ticket sales will go to KMS and the Kyrene Foundation to support essential services for students and teachers in Kyrene schools. 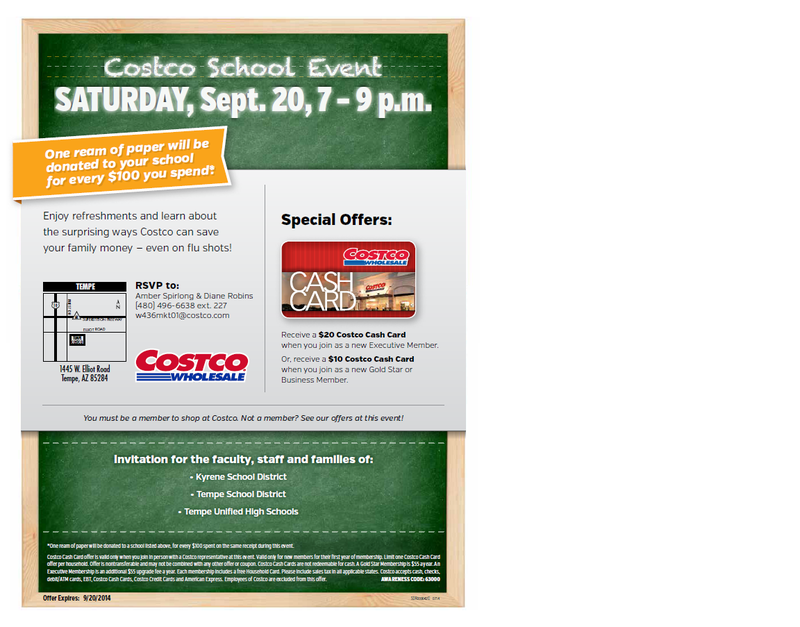 Help us Earn Paper from Costco! KMS will earn a ream of paper for every 100$ spent. Please, save up your Costco shopping for THIS night. Costco is generous enough to provide us a paper earning night. And KMS NEEDS PAPER. We are excited for this opportunity for you to help our school without buying anything more then you usually would! For every 100 dollars our school spends that night, we will get a ream of paper for our school. Teachers are also filling out a "supply list", for familes who are willing to help them out as well. Please save your lists for that night. It will really help our school out. Please email or comment with any questions! **Gas, photo, hearing aid center, pharmacy, and optical will not participate in totals for donations as they all will be closed (except for the gas station).